Quick and easy chocolate caramel slice, AKA millionaire’s shortbread. 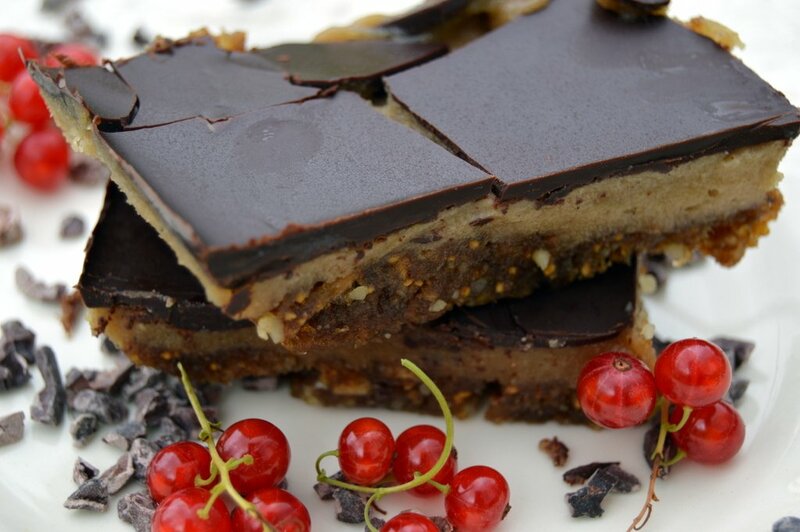 It’s dairy and gluten-free with a fruit and nut base, a cashew caramel middle and chocolate topping. 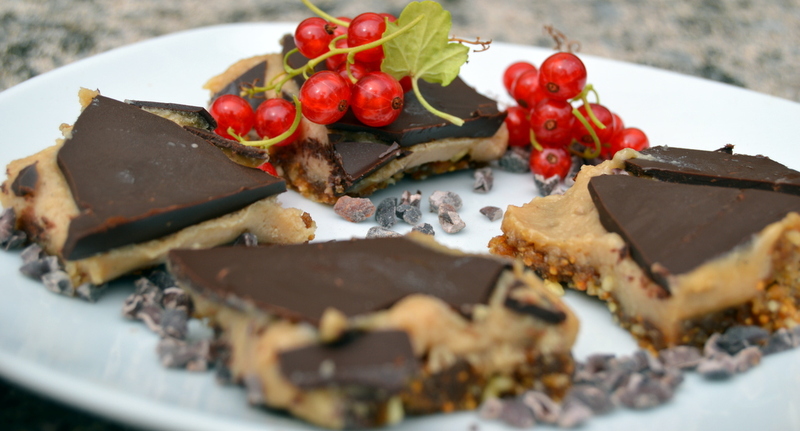 This no-bake bar can be made in about 10 minutes. You can use any chocolate you like for the topping. I usually use a very dark 85% cocoa solids chocolate. If you want to make your own raw chocolate topping mix together 1/3 cacao powder with 1/3 fat and 1/3 sweetener. You can use coconut oil or cacao butter for the fat. For the sweetener anything runny such as maple syrup, date syrup, coconut nectar or honey work well. All of these sweeteners also work well for the caramel and each give a slightly different taste. Let me know how you get on in the comments. Chocolate, 100g / 3.5oz of your favourite. See intro for making a raw chocolate topping. Blend together the walnuts and figs until they are combined into a ball. Spread this out on a tray that’s about 10″ by 10″. Melt the coconut butter / oil. Add this melted coconut with all the other caramel ingredients to a blender and whizz until a smooth caramel is formed. If it becomes too thick to blend just add some hot water, 1 tbsp at a time until you can blend it smooth. Melt the chocolate, spread over the top and chill. Store in the fridge and it will last for 3-4 days in theory, but mine is always eaten way before then. The figs in the base can be replaced by other dried fruit such as dates if you prefer. I like to use figs as the fig seeds when blended give a crispy texture that works well with the smooth caramel and sharp chocolate. If you want to cut the chocolate caramel into clean sharp squares take it out of the fridge half an hour before cutting. As you can see from my photos I didn’t do this so most of the chocolate topping is roughly cracked, but that’s how I like it. If you cut the chocolate caramel slice when the chocolate is hard from the fridge it will look like this. I like the smashed chocolate affect but if you don’t then cut at room temperature with a sharp knife to get clean and sharp edges. 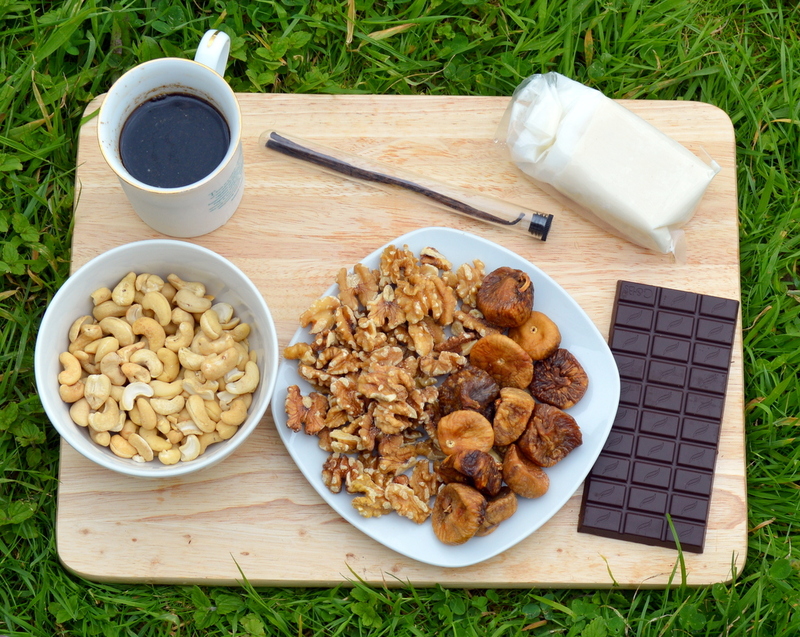 To make nut-free you can replace the walnuts with pumpkin seeds and the cashews with sunflower seeds. Both coconut and cocoa beans are actually seeds despite the misleading names so are suitable for people with a peanut or tree nut allergy. these chocolate caramel slices are to die for ! Not too sweet just enough to satisfy a treat craving, thanx for the gluten free vegan recipes ! These are gorgeous! Not too sweet,and my 4 year old loves them. A great way to eat healthily but feels like a yummy treat. Hi could you tell me if you are using dried or fresh figs? From the video it looks like dried but wanted to check first, thank you. Hi therey, they are indeed dried figs. I’ll update the recipe to make that clearer thanks.